You are here: Home / destinations / Aeolian Islands Cruises: Stromboli, Island on fire! 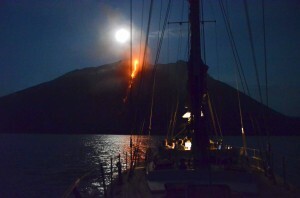 Aeolian Islands Cruises: Stromboli, Island on fire! Stromboli is a volcanic island, and very much alive and kicking at that! One of the eight Aeolian Islands to the north of Sicily in the Thyrrenian Sea, Stromboli has been bubbling up or erupting on almost a daily basis for the past 2000 years. Strombolian eruptions are characterised by short energetic bursts of ash, lava and rock material, ranging up to a few hundred meters in height, giving visitors plenty of opportunity to observe this breath taking phenomena from numerous points on the island. Because of its continuous eruptions, the island is also known as the ‘Lighthouse of the Mediterranean’. The only settlements on the island are the villages of San Bartolo, San Vincenzo and Ginostra, where around some 400 people live. Stromboli’s economy is based on tourism as well as agriculture and fishing, and this beautiful short film gives a glimpse into the life of a Strombolian fisherman. Limited fresh water availability and the lack of a protected port have ensured that the island has remained untouched by the trappings of metropolitan life. Quite simply, life on the island is defined by the volcano, the land, and the sea. Strombolicchio is a tiny rock island to the north east of Stromboli, formed as erupted material accumulated out of one of the vents of Stromboli’s original volcano. No longer active, it is now a natural reserve and host to some endangered flora and fauna, which means that access is generally restricted. A lighthouse dominates its flat plateau, which however is open to visitors, and can be reached by some 200 concrete steps. 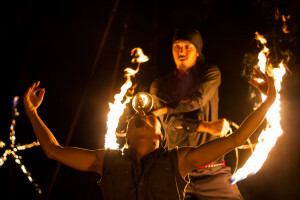 A great time to visit Stromboli is between the 30th August and the 13th September this year, when the island will be hosting its ‘Festa del Fuoco’ (a celebration of fire). Have we fired you up? Check our website for more information on how to book the sailing trip of a lifetime.